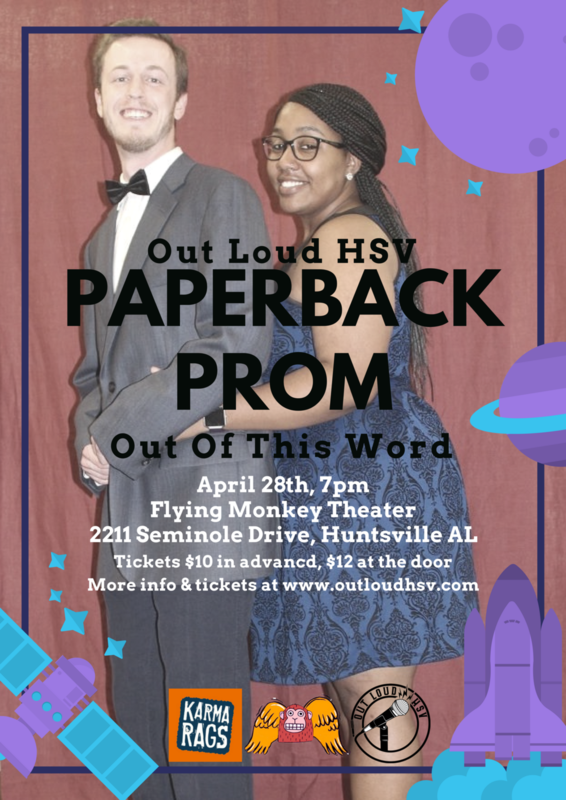 Join us for an interstellar evening at Out Loud HSV's Paperback Prom: Out of This Word! On April 28th at 7pm get dressed up and join us in the Flying Monkey Theater for music, raffles, snack and punch, photo opportunities, open mics and more, all to help raise funds for the 2018 Out Loud HSV Poetry Slam Team. We will have two open mics - the first will be Space Themed at 7:30pm, and our Dramatic Recitations of Prom Songs open mic will follow. Sign up and perform for one or both for the chance to be crowned our 'Prom Person'. Dance under the stars to music, enter the raffle to win wonderful local goodies, and enjoy food & cosmic punch! Need a new outfit for the occasion? Visit our incredible sponsor Karma Rags and mention the Out Loud HSV prom for a discount on your outfit! Green Pea Press will be on site printing up souvenir shirts for the evening so get them while you can!